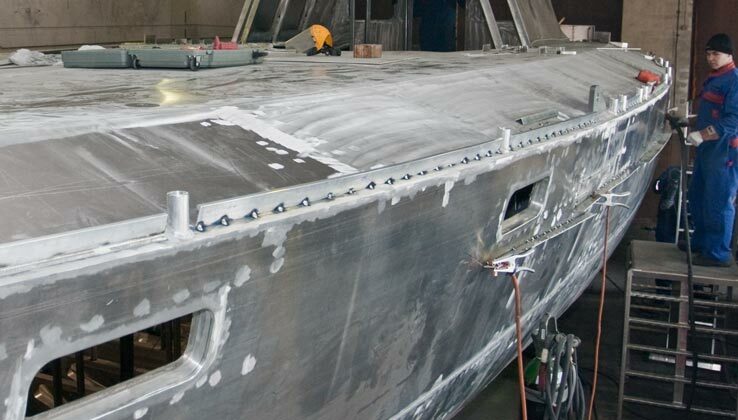 Whatever you call it, it’s an important part of the looks of the boat, so it’s nice to see it go on! It will not be perforated? Looks quite thick – how much does it weigh all together? There are enough gaps in the railing that perforation is not needed. Actually the material is quite thin at the base, but it has a thick bulb at the top. The total weight of the whole railing is about 10 kg. We did some test on the strength of a perforated railing, but a big guy (guess who!) jumping on it was able to bend it a little. Which didn’t feel safe. 10kg is nothing :-) It just seemed from the pic that it didn’t have the “bulb” on the top.